One week after its successful landing on the surface of Titan scientists have given more details on the observations made by the probe. Results based on information for all instruments. 12:50:24 Cassini signal detection ended, giving 72 minutes data on surface. A mosaic of three frames provides unprecedented detail of the high ridge area including the flow down into a major river channel from different sources. 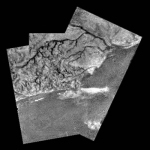 A dark plain area on Titan, seen during descent to the landing site, that indicates flow around bright islands. The areas below and above the bright islands may be at different elevations. Two new features on the surface of Titan: a bright linear feature suggests an area where water ice may have been extruded onto the surface and short, stubby dark channels that may have been formed by springs of liquid methane rather than methane rain. Methane levels changes over time on the surface implying a release of methane. The origin is probably liquid methane located just below the surface.